Lewis TUCKER-7721 was born in 1799 in New York, United States. He died in Apr 1862 in De Soto, Washington, Nebraska, United States. Lewis married (MRIN:3371) Lois FARR-7719 in Apr 1819 in Fort Ann, Washington, New York, United States. Lois FARR [Parents]-7719 was born on 15 Mar 1796 in Fort Ann, Washington, New York, United States. She died on 10 Oct 1871 in Arizona, Burt, Nebraska, United States. Lois married (MRIN:3371) Lewis TUCKER-7721 in Apr 1819 in Fort Ann, Washington, New York, United States. William FARR [Parents]-7720 was born on 25 Jun 1808 in Fort Ann, Washington, New York, United States. William married (MRIN:3372) Polly SEELEY-12331 on 14 Jan 1835 in Washington, New York, United States. William was counted in a census 1 in 1840 in Fort Ann, Washington, New York, United States. Polly SEELEY-12331 was born on 25 Jun 1808 in of Kingsbury, Washington, New York, United States. Polly married (MRIN:3372) William FARR-7720 on 14 Jan 1835 in Washington, New York, United States. F i Betsey Elizabeth FARR-12328 was born in 1837. She died in 1904. Caroline FARR 1-12330 was born in 1838 in Fort Ann, Washington, New York, United States. Caroline was counted in a census 2 in 1850 in Fort Ann, Washington, New York, United States. Dexter FARR 1-12333 was born in 1843 in Fort Ann, Washington, New York, United States. He died 2 on 24 Aug 1892 in Manhattan, New York, New York, United States. Dexter was counted in a census 3 in 1850 in Fort Ann, Washington, New York, United States. 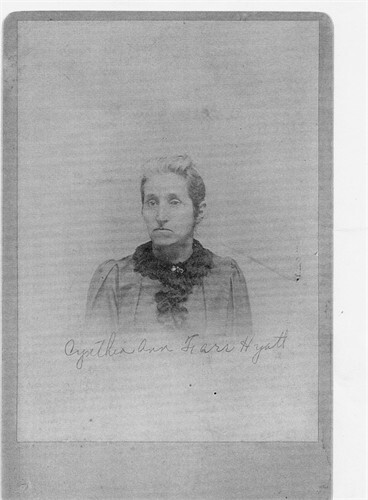 Imogene FARR 1-12329 was born about 1845 in Fort Ann, Washington, New York, United States. Imogene was counted in a census 2 in 1850 in Fort Ann, Washington, New York, United States. James FARR [Parents]-7725 was born on 16 Aug 1798 in Essex, New York, United States. He died on 18 Apr 1873 in Fayette, Iowa, United States. James married (MRIN:3373) Electa Levina HOLLENBECK-7726 in 1830 in Spring, Crawford, Pennsylvania, United States. Electa Levina HOLLENBECK-7726 was born on 28 Jul 1812 in Sharon, Windsor, Vermont, United States. She died on 3 Aug 1893 in West Union, Fayette, Iowa, United States. Electa married (MRIN:3373) James FARR-7725 in 1830 in Spring, Crawford, Pennsylvania, United States. Ruluff FARR-9335 was born in 1833 in Ohio, United States. He died in Jul 1887 in Buffalo, Nebraska, United States. He was counted in a census 1 in 1850 in Genoa, DeKalb, Illinois, United States. M ii Levi FARR-9336 was born in 1839. He died after 1900. Helen FARR-9337 was born in 1840 in Illinois, United States. Helen was counted in a census 1 in 1850 in Genoa, DeKalb, Illinois, United States. Emeline FARR-9338 was born in 1842 in Illinois, United States. Emeline was counted in a census 1 in 1850 in Genoa, DeKalb, Illinois, United States. Alice FARR-9339 was born in 1849 in Illinois, United States. Alice was counted in a census 1 in 1850 in Genoa, DeKalb, Illinois, United States. Ambrose FULLER-7730 was born about 1789 in Addison, Vermont, United States. Ambrose married (MRIN:3374) Pearl FARR-7727. Pearl FARR [Parents]-7727 was born in Jun 1800 in New York, United States. She died on 1 Feb 1837 in Beaver Center, Crawford, Pennsylvania, United States. Pearl married (MRIN:3374) Ambrose FULLER-7730. John POWERS-7731 was born on 9 Nov 1807 in Bennington, Bennington, Vermont, United States. He died on 26 Feb 1892 in Oelwein, Fayette, Iowa, United States. John married (MRIN:3375) Melissa Ann FARR-7729 about 1836 in New York, United States. Melissa Ann FARR [Parents]-7729 was born on 24 Nov 1816 in Schroon, Essex, New York, United States. She died on 19 Jul 1892 in Oelwein, Fayette, Iowa, United States. Melissa married (MRIN:3375) John POWERS-7731 about 1836 in New York, United States. Stephen FARR [Parents] [scrapbook]-7733 was born 1 on 15 Feb 1828 in Watertown, Jefferson, New York, United States. He died 2 on 6 Jun 1892 in Des Moines, Polk, Iowa, United States. Stephen married (MRIN:3376) Angeline FULLER-7735 about 1847 in New York, United States. Stephen worked as laborer in 1850 in Clayton, Jefferson, New York, United States. Listed in the probate of his father. Agriculturalist; Iowa Sup. of Railroad Const. briefly. Angeline FULLER-7735 was born in 1830 in Groton, Grafton, New Hampshire, United States. She died on 18 Mar 1868 in Des Moines, Polk, Iowa, United States. Angeline married (MRIN:3376) Stephen FARR-7733 about 1847 in New York, United States. Sarah FARR [scrapbook]-12878 was born on 30 Oct 1850 in Polk, Iowa, United States. She died on 30 Mar 1856 in Polk, Iowa, United States. M ii Wilbur H. FARR-8882 was born on 31 Jan 1855. He died on 5 Jun 1919. M iii Elmer E. FARR-8884 was born in Jun 1860. He died on 26 Jul 1903. M iv Clarence Albert FARR-8885 was born on 9 Sep 1865. He died on 10 May 1924. Stephen FARR [Parents] [scrapbook]-7733 was born 1 on 15 Feb 1828 in Watertown, Jefferson, New York, United States. He died 2 on 6 Jun 1892 in Des Moines, Polk, Iowa, United States. Stephen married (MRIN:3377) Adeline M. GOODHUE-8883 after 1861 in Iowa, United States. Adeline M. GOODHUE-8883 was born in 1845 in New Hampshire, United States. She died in 1922. Adeline married (MRIN:3377) Stephen FARR-7733 after 1861 in Iowa, United States. F i Nellie Frances FARR-12879 was born on 17 Feb 1872. She died on 25 Jun 1935. M ii Walter Herbert FARR-12880 was born on 21 Mar 1878. He died in 1950. M iii Stephen FARR-12881 was born on 26 Mar 1881. He died in 1943. Thomas W. SHEPARD-7736 was born on 1 Dec 1815 in New York, United States. Thomas married (MRIN:3378) Anna A. FARR-7734 on 30 Mar 1850 in New York, United States. Anna A. FARR [Parents] [scrapbook]-7734 was born in 1835 in Hounsfield, Jefferson, New York, United States. She died on 10 Jun 1891 in Vernon, Yuma, Colorado, United States. Anna married (MRIN:3378) Thomas W. SHEPARD-7736 on 30 Mar 1850 in New York, United States. Listed in the probate of her father as " Anna A. Shepard". Henry A. JENNINGS-12940 was born 1 in Sep 1818 in Goshen, Orange, New York, United States. He died 2 on 7 Nov 1904 in Denver, Denver, Colorado, United States. Henry married (MRIN:3379) Anna A. FARR-7734 on 27 Sep 1885 in Aurora, Arapahoe, Colorado, United States. Anna A. FARR [Parents] [scrapbook]-7734 was born in 1835 in Hounsfield, Jefferson, New York, United States. She died on 10 Jun 1891 in Vernon, Yuma, Colorado, United States. Anna married (MRIN:3379) Henry A. JENNINGS-12940 on 27 Sep 1885 in Aurora, Arapahoe, Colorado, United States. Josiah WHITNEY-7738 was born on 12 Oct 1731 in Stow, Middlesex, Massachusetts, United States. He died on 4 Jan 1806 in Ashburnham, Worcester, Massachusetts, United States. Josiah married 1 (MRIN:3380) Sarah DWELLY-7739 on 3 Feb 1774 in Harvard, Worcester, Massachusetts, United States. Sarah DWELLY-7739 was born in 1733 in Bridgewater, Plymouth, Massachusetts, United States. She was christened 1 on 5 Oct 1746 in Scituate, Plymouth, Massachusetts, United States. She died on 18 Feb 1817 in Whitingham, Windham, Vermont, United States. Sarah married 2 (MRIN:3380) Josiah WHITNEY-7738 on 3 Feb 1774 in Harvard, Worcester, Massachusetts, United States.